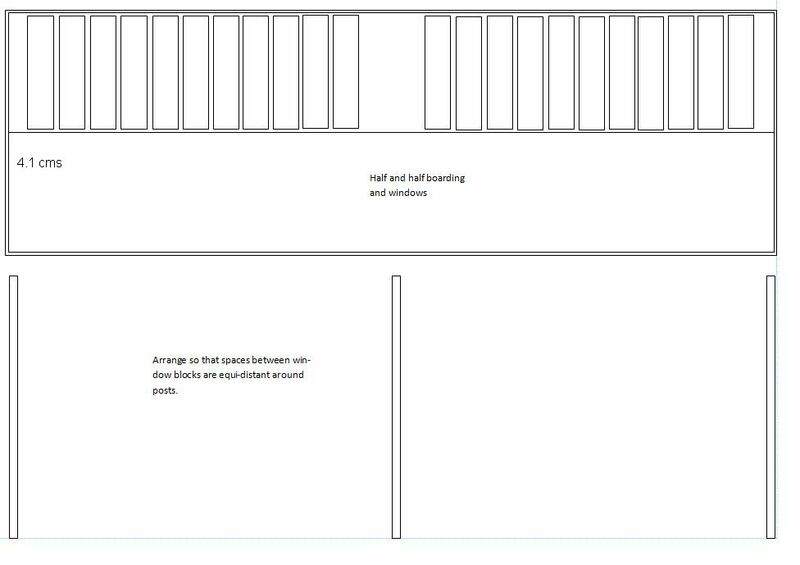 I have drawn up several plans and quantified the materials needed to complete this project. Here is the cross section drawing. This diagram shows the exact lengths and cut-outs for the cross sectional spars. 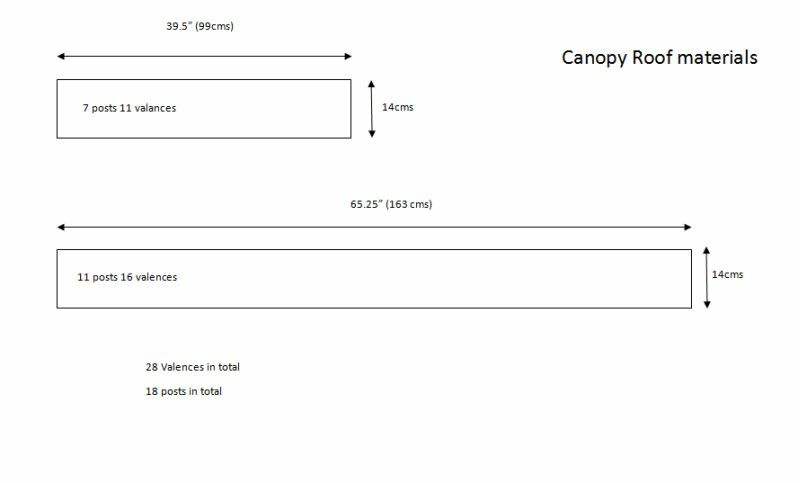 Below are quantity estimates for each canopy. All the roof struts have been cut out. 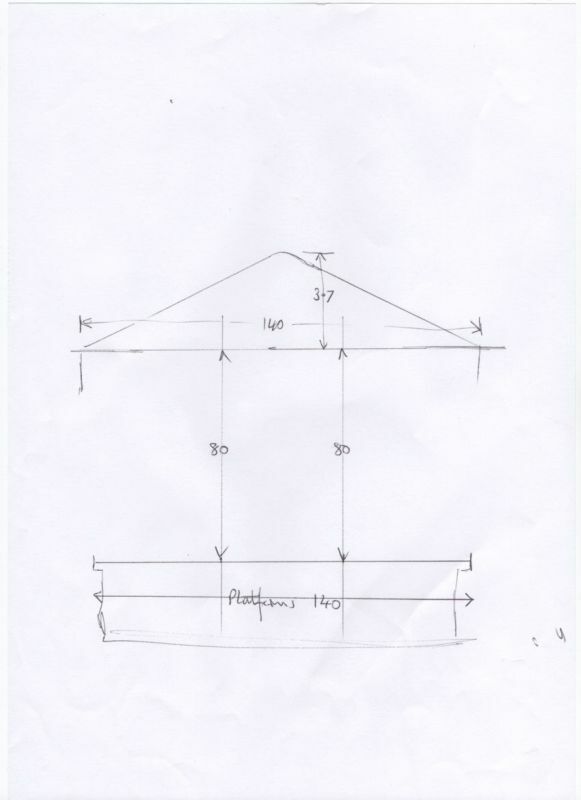 The canopies require 18 sets of framing for the roof. Here is one as a mockup. Next stage is to cut up all the lengths for the posts and cross members. Reconsidering any design fluctuations to make building easier. To this end the central spar will be cut down to allow for a continuous spar on the apex to be created. But in the meantime here are the pieces cut, ( a days work). The small tubes will fit through the platform to support the posts for the canopy. They are long enough to stick up out of the platforms to look like part of the posts. the posts themselves will slide telescopically into them and will enable the canopy to be removed at a later date whenever necessary. Here are the 'T' pieces constructed from the longer brass tubing in place for a fitting with spars resting on them. Having left the uprights in place over night, I then removed them to fit the support brackets to each 'T' piece. Here they are drying off. I stuck them in place using Bostik. The brackets are from Model Signal Engineering code LS013 and are Taff Vale Railway brackets. Although I'm not modelling that part of the world they do look the part. I've redesigned the central spigot so that the roof spars rest on top of it, this will allow a long apex spar to ride across several supports to add strength. Here the 18 central spigots have had a brass pipe installed to fit into the top of the posts to aid alignment and strength. Here they are stuck in place. Next to secure the edge strips along each side. The structure nearest the camera is still waiting for the remaining posts to arrive. Having framed up the canopy insitu, its now time to remove them ready for finishing and painting. Here is one with the posts and brackets painted. The next job is to fit the panelling on the roof and the glazing. The lower roof partitions have now been glued in position. The windows have taken a while to organise and finally i came up with the simplest option. single strips of Plastoglaz lined out with a marker pen to represent frames, as shown here. I made up a jig board with 1cm marks to help space out the lines on the plastiglaz. 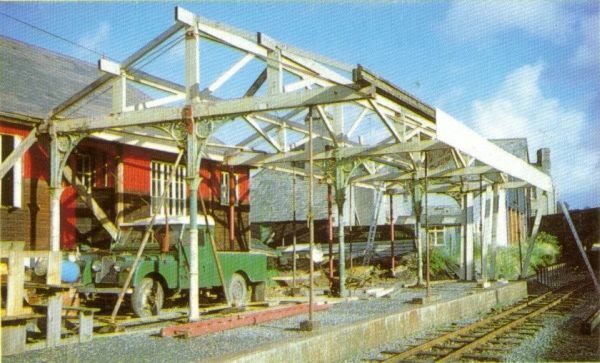 The roof lower section was then painted GWR freight grey as shown above. The second shorter canopy has also been finished, created in exactly the same way as the one above. The ridge support was actually in pieces and not long strips spanning several supports. This was because the geography of the ridge was not totally square and perfectly horizontal. but when finished it looks more prototypical. As the station was hit by two incendiary bombs in the war, (dropped from a Zeppelin), the repair was effected very well! Just waiting for a the valences and news stand and ladies waiting rooms to arrive to finish off but this is the current canopies insitu. The valance has arrived and has been glued and painted.. Here are the finished canopies. Some time ago when exploring the potential for making these canopies out of brass instead of wood. i produced a small framework. Here it is now completed and painted and put to use at the other end of the line. If you look carefully there is a famous chap standing on the nearside platform edge waiting to have a chat with the driver of the train. As you can see from some of the pictures above. the main station building seems a little small to cope with the large station. So I have ordered another waiting room section to add to the building. 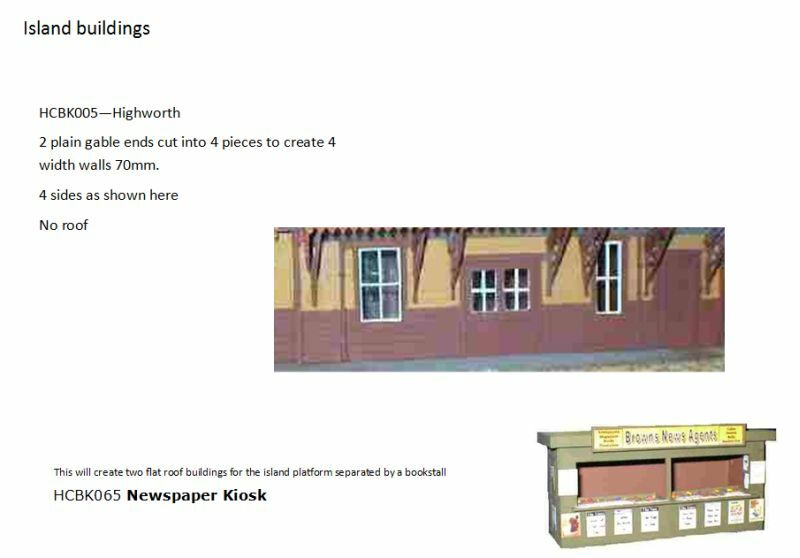 A newspaper kiosk is competed and positioned roughly in the correct area but subject to the enlargement of the station building. A new Victorian toilet is in situ on the other terminus station replacing the smaller which is now at the other side of the station building. Again this will need adjusting once the enlarged building is back. The other gents has had to be moved down to the opposite side of the station building at Longhampton bridge as some of the passengers crossing it said it could be viewed easily from the footbridge! 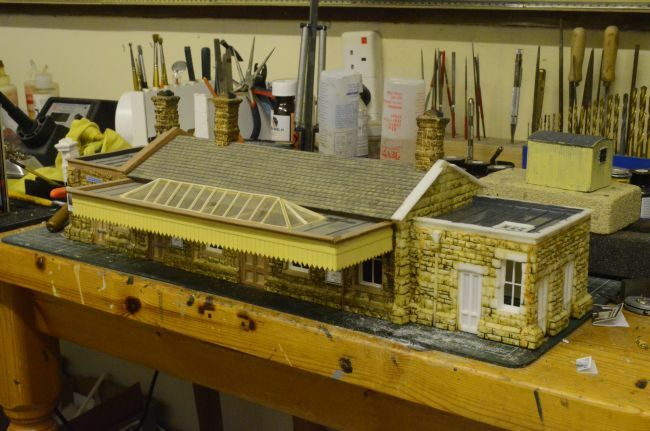 Using a series of images from a restored station and lime strip usually used for model boat building i am constructing the station canopy.